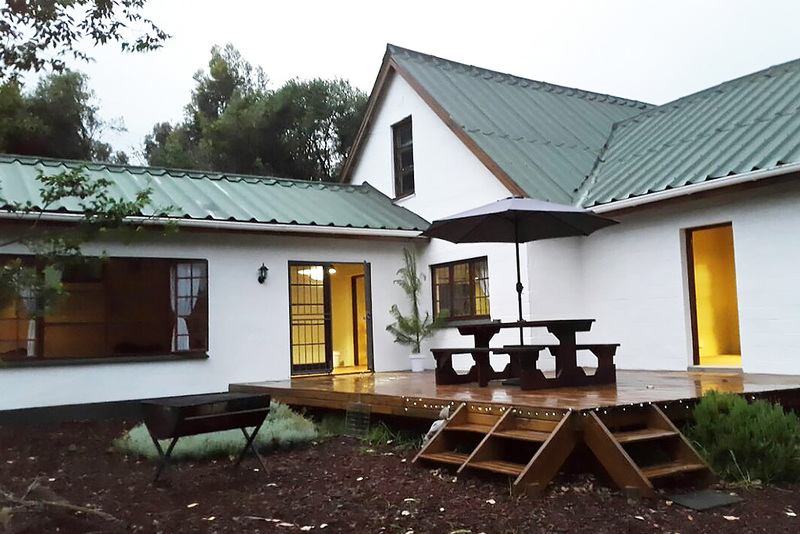 Gypsy Forest is a rustic farm house situated far from the madding crowd outside the sleepy town of Sedgefield along the scenic Garden Route. Sitting atop a hill away from society it`s a place where you can relax in the silence of the forest. The house is well lit by natural light and is very spacious. 1 x large main bedroom with a Queen bed sleeping 2, a smaller room with a tri-bunk bed sleeping 3, and a very comfortable sleeper couch in the lounge sleeping 2 - total of 7 sleeper. Blankets, Gas heater and Gas to fuel provided for those cold evenings. It also offers a large wooden deck outside, shaded by umbrellas when needed, for sun lounging or star gazing at night. A large braai accompanies the deck. The beauty of Gypsy Forest is the silence and peacefulness surrounding you. The property has 6 hectares of land which is unexplored but is surrounded by no developments and gives the feel of hundreds of hectares. The elusive Knysna Loeries visit daily with many other bird types. It is great for families. Fully equipped for all your needs. Your furry loved ones are welcome but may not be on any furniture / beds. Kindly also tend to any spills. Bring own floor bedding for dogs. Bird watching, boating, canoeing, fishing, hiking, mountain biking, stargazing, surfing, swimming, walking, whale watching. Garden Route Trail Park is only a few minutes away - nestled at the foot of the Outeniqua Mountains and the Karatara River Gorge. Their carefully designed routes are laid out to provide riders of all levels an exciting time. Over 20km of hand built single track for the mountain bikers. For the runners there is flowing forest trails following the Karatara River, surrounded by Massive rock pools, waterfalls and boulders.